Although the shutdown is over for federal employees, many of our clients are still unsure about how they will afford food without increased help from the Food Bank . As you may not know, many people we serve also receive federal nutrition benefits (CalFresh) and because of the recent government shutdown, families will be receiving their next benefit 10 to 20 days late. This disruption in CalFresh benefits is predicted to cause an unprecedented strain on food banks. CalFresh typically provides families with enough food to last two to three weeks and a third of all recipients already rely on food banks to make ends meet. Help us meet this increased need. As we sit down for Thanksgiving dinner, let’s think of the millions of Americans who don’t know where their next meal will come from — and the millions more who will be in the same predicament by next Thanksgiving if the president has his way. He acted by attacking social safety-net programs, like the Supplemental Nutrition Assistance Program, the program formerly known as food stamps and now known in California as CalFresh. SNAP is the nation’s largest domestic food assistance program that gives financial support to families that cannot always afford to put food on the table. The president and congressional Republicans are using the budget on this crusade to undermine SNAP. In his 2019 budget, President Trump proposes slashing SNAP by $17.2 billion, which would leave at least 4 million people hungry. Republicans have also proposed funding cuts through reauthorization of the Farm Bill by trimming as much as $75 per month from monthly benefits for up to 1.1 million families. Farm Bill negotiations are currently underway and, while we cannot predict the outcome, it is clear that House Republicans and the president are after a funding cut however they can get it. And they want to get this done before Democrats, who do not support these cuts, take over the majority in the House in January. The administration is not leaving the cutting to Congress, though, and has proposed its own way to hinder the program. Currently, the rules of the program require all SNAP recipients who are able-bodied adults without dependents to be employed at least 20 hours a week. Recognizing regional differences in access to work, states or localities can apply for a waiver to this rule to decrease the hardship on families. The administration proposes a rule change that would eliminate waivers altogether except in exceedingly rare circumstances. This change would go back on more than 20 years of precedent and would endanger benefits nationwide. California had a statewide waiver for nearly a decade before it expired this year, but most counties still have individual waivers. By this time in 2019, 52 of the state’s 58 counties could still be covered by waivers. Those counties would be in danger of losing those waivers if the administration’s rule change goes into effect. Further, if the state goes through another economic downturn, it would be at risk of not qualifying for future waivers. The administration’s proposal is still in draft form, but it is almost universally recognized that the administration will wield its power to see this through in one form or another. It could take months or longer to go into effect. While work is the best path to self-sufficiency, threatening someone with hunger is cruel and in no way incentivizes employment. Our duty as a nation is to provide for all Americans and ensure that they can live healthy and successful lives. Federal nutrition programs reflect that commitment. Rather than cutting funding and imposing arbitrary requirements, we should invest in job training and workforce development while also protecting successful safety-net programs like CalFresh. With additional support, we will see much more success in assisting families to enter the workforce and attain well-paying jobs, which in the long term can help them transition off CalFresh when they are ready. The Food Bank of Contra Costa and Solano has already facilitated two community-wide meetings on the topic and local community colleges are poised to roll out employment and training programs on their campuses early next year. This holiday season, I am grateful to live in a community that is already coming together to protect our most vulnerable residents. We must all continue to fight Trump’s policies and protect nutrition programs and those they serve so that everyone can enjoy a plentiful Thanksgiving — this year and all the years to come. In a historic budget agreement signed by the Governor on June 27th, the state of California is finally easing hunger for Supplemental Security Income (SSI) recipients. This 2018-19 budget deal will allow Californians on SSI to qualify for CalFresh nutrition assistance beginning in mid-2019. SSI is a safety net program that provides a minimal basic income to older adults and people with disabilities who have little-to-no other income and resources. Although the maximum income grant for an individual is just $910.72 a month, SSI recipients have been ineligible for CalFresh, formerly known as food stamps, since the 1970s. During the Great Recession in 2009 and 2010, the state of California cut its contribution to SSI grants down to the minimum amount allowed by the federal government and stopped automatically adjusting for inflation. The maximum individual benefit now stands at less than 90% of the federal poverty line. After nearly a decade without meaningful restorations to this program, the 2018-19 budget finally lifts the ban on CalFresh and reinstates annual cost-of-living adjustments. Although the base grants still need to be brought up above the poverty line, the addition of CalFresh benefits will have an enormous impact for the 1.3 million Californians on SSI. The state estimates that a single adult on SSI will likely qualify for $171 a month in CalFresh benefits. With the current CalFresh ban still in place, most SSI recipients turn to community-based organizations like food banks just to survive. Nearly 1 in 4 households served by the Food Bank of Contra Costa and Solano includes an SSI recipient. Janet Ternes, a 70-year-old SSI recipient from San Pablo, relies on the Food Bank’s Senior Food Program to stretch her limited budget. “They give me vegetables and canned foods and dried foods [at the Food Bank,] and I can only afford to go to Grocery Outlet for the rest. If it wasn’t for the Food Bank, I don’t know what I’d do,” she says. The new state budget also provides food banks with $8 million to purchase California-grown foods and another $5.5 million to support distribution capacity by investing in trucks, refrigerators, and other infrastructure. Because CalFresh benefits won’t be available to SSI recipients for about a year, due to necessary administrative preparations, the $13.5 million designated for California food banks will help meet SSI recipients’ food needs in the meantime. Food bank distributions are open to anyone in need, but SSI recipients in particular will benefit from this investment since so many rely on food banks as their primary source of food. Finally, because a monthly income of $910.72 doesn’t even come close to the cost of a market-rate studio apartment in the Bay Area, this budget will provide additional relief to some SSI recipients through $500 million in grants for California cities to address homelessness. On the whole, this budget takes significant steps to address the urgent poverty SSI recipients experience in California. The state still needs to restore the cuts to the base grant so people can meet their basic needs, like housing and medicine, but at least hunger will be less of a constant threat. We commend the legislature and Governor Brown for passing a budget that both saves for a future rainy day and offers an umbrella to those for whom it is already raining. To support grassroots solutions to hunger, the Food Bank of Contra Costa & Solano has piloted the Speaker Series. This advocacy-training program for community members with lived experiences of hunger is designed to lift up the voices of real people facing hunger issues so they can become agents for change in their community. The Food Bank‘s inaugural Speaker Series kicked off in 2017 with the Vallejo-based food pantry Faith Food Fridays and Toastmasters International. 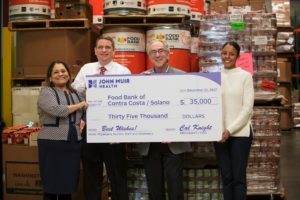 This year the Food Bank and Toastmasters co-hosted the Speaker Series with the financial services nonprofit SparkPoint Contra Costa in Bay Point. The 3-month program consists of weekly workshops on public speaking, advocacy, and civic engagement. The participants come together to share their stories of hunger and build a community of hunger fighters. Graduates from both Speaker Series attended Hunger Action Day in May in Sacramento to put their advocacy skills to work. Participants met face-to-face with their state elected officials, shared their personal stories of hunger and called for the passage of public policies that support food access and economic security. Community members and elected officials attending June’s release of the Food Bank’s Hunger Study results also heard from some of the graduates of the Speaker Series as they described what it’s really like to be food insecure. Assurances like this are essential to calm fears and maintain access to critical services. Unfortunately, confusion and fear around the issue of immigration have caused some local families to feel that it is no longer safe to use needed services available in our community. The Food Bank of Contra Costa and Solano believes the Department of Homeland Security can prevent unnecessary hunger by expanding the scope of this commitment. We urge them to issue guidance that includes food distribution sites on the list of sensitive locations protected from routine immigration enforcement actions. Everyone should feel safe receiving nutrition assistance, not just those impacted by Hurricane Harvey. The Department of Homeland Security established that its emergency response priorities are “to promote life-saving and life-sustaining activities,” but not all emergencies are caused by natural disasters. Food banks across the country provide life-saving and life-sustaining services every single day for families coping with personal emergencies, like a sudden illness or the loss of a job. The Food Bank and our partner agencies provide food to anyone in need. As a private nonprofit, we do not ask and are not required to report the legal status of anyone we serve. However widespread worries and misconceptions about new immigration policies have led some families to avoid our services. We recently met a woman at a distribution in Fairfield who was picking up food for herself and another family. She explained that her neighbors stopped coming to that site because of their immigration status; the parents were afraid and barely left their home at all. Worried that her neighbor’s children were going without food, she offered to bring home an extra bag for them. Not everyone is lucky enough to have such concerned neighbors. Another woman in Concord shared with our staff that she decided to homeschool her 18 year-old son during his senior year of high school. Although he had protected status under the DREAM Act at that time, his mother was afraid that going to public school in this political climate was too risky. She said she would rather her son miss out on the free lunches he got at school than risk deportation. The Food Bank encourages all public leaders, from local city council members to the Director of Homeland Security, to help fight hunger. We urge them to address barriers to food access created by the climate of fear and uncertainty. Everyone deserves the reassurance that the victims of Hurricane Harvey have received – that there will be no repercussions for seeking out food assistance. No one should be hungry, especially when resources like the Food Bank are available. The president released his proposed FY 2018 budget this month that calls for $193 billion in cuts to the Supplemental Nutrition Assistance Program (SNAP) over the next decade. These deep cuts represent a 25 percent reduction in funding, a move that would increase hunger and deepen poverty for millions of Americans already struggling to make ends meet. About 67,000 individuals in Contra Costa County and 40,000 in Solano County relied on federally-funded SNAP benefits each month of 2016 – about half of whom were children. In an effort to reduce federal spending on SNAP, the budget both cuts vital nutrition funding and pushes costs onto states—an historic shift that would permanently alter SNAP’s entitlement structure and abandon our nation’s long-standing bi-partisan commitment to combat hunger. The current structure of SNAP allows the program to flexibly expand and contract its caseload based on need, ensuring that benefits are available to anyone who qualifies. The proposed changes, however, would require states to pay for 25 percent of benefits that are currently fully funded by the federal government. Restructuring SNAP’s program structure would require California to absorb $1.8 billion annually in SNAP benefit costs. Such cost-shifting measures would undermine SNAP’s efficiency, flexibility, and reach—particularly in times of economic recession. The budget proposal also targets low-income seniors and the working poor by proposing to eliminate the minimum monthly SNAP benefit of $16. This would result in 110,000 individuals in California being kicked off the program, the vast majority of whom are seniors living on Social Security and low-income workers who use SNAP to supplement their earnings. Eliminating the minimum benefit would also cause the state to lose $14 million each month in SNAP benefits that currently flow into local economies and support food retailers and farmers. The president’s budget contains a number of other harmful proposals that would increase hunger, restrict eligibility and reduce benefits for California’s low-income families. These threats including time limiting SNAP benefits for childless workers in areas of high unemployment, benefit caps for large SNAP households, and prohibiting California and other states with high costs of living from assisting families with incomes over 130 percent of the federal poverty line. These proposed cuts to SNAP would force even more Americans to rely on emergency food assistance providers like food banks, but the president’s budget proposes $27 million in cuts to these charitable organizations. The federal Temporary Emergency Food Assistance Program (TEFAP) provides local organizations with dried and canned food items, representing more than 13% of all pounds distributed by the Food Bank of Contra Costa and Solano last year. “There is no way that food banks and other charities could replace the proposed billions in cuts to SNAP benefits,” says Caitlin Sly, Program Director at the Food Bank of Contra Costa and Solano. “Food banks are a complement, not a substitute, to the safety net.” Only 1 in 20 emergency assistance meals are provided by nonprofits, the rest flow through federal nutrition programs like SNAP. The budget proposal also includes cuts of $627 billion from Medicaid, $21 billion from Temporary Assistance for Needy Families (TANF, also known as Welfare-to-Work), and $72 billion from Social Security programs like Supplemental Security Income (SSI) that support low-income seniors and people with disabilities. The president’s budget sends the message that hunger is an acceptable outcome in America. The Food Bank is urging Congress to oppose any budget proposal that goes back on our decades-long commitment to eradicate hunger and support a bi-partisan budget deal that invests in the health and nutrition of nation’s most vulnerable residents.